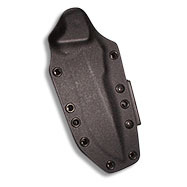 Most knives come standard with a superb form fitted black kydex sheath. There are several option available for setting up your preference to carry the knife. The first one is a multi- position belt sheath with a removable TEK-LOK belt clip for attachment to a backpack, belt or similar item. The Second offering available upon request with a additional charge is a drop leg sheath for larger knives. Website design and development by Metschan Media.